Come Home To Where You Belong! Franklin D. Pullin was called to Western Hills in 2006. He came from Menard, and has called several Texas churches home over the years. Bro. Pullin recently celebrated the 50th anniversary of his service as pastor/preacher of Southern Baptist churches. 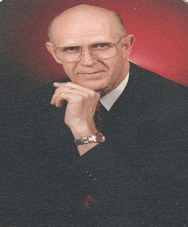 He is a graduate of Howard Payne University and the Universal Bible Institute of Alamo, Tennessee, and was licensed to preach at Fabens, Texas in 1961. His first pastorate was at a mission of the First Baptist Church in Brady, Texas. His wife Rosemary, has been at his side since 1967, supporting his ministry and creating her own niche as an outstanding pianist in the music ministry of the churches to which they were led. They have raised three children to love and follow the Lord – Greg, Lisa, Jeff and their respective families all live in the Kerrville – San Antonio area - - and all enjoy a very close physical and spiritual bond with each other. In February 1986 Bro. Frank and his family moved to Bandera, Texas. Bro. Frank became pastor of First Baptist Church and served 18 years there. It was at Bandera that Bro. Frank preached a series of messages on Lighthouse Christians. This became a focus for his ministry after that – that as Christians, we must reflect the Light from Jesus who is THE LIGHT OF THE WORLD. While there they saw church growth and had a building program to provide more needed educational space for the Sunday School. Bro. Bill Kinney was important to them in this process. He served as their building coordinator of the new educational building. They experienced growth to the point we they started two morning worship services and two Sunday Schools. Bro. Frank also assisted with two other building projects during the years at Bandera. These were building for two missions – Walker Memorial and the other Spanish Mission. Their children were teen-agers when they moved to Bandera and so they really grew up there and “left the nest” during the 18 years they were there, Special blessings were seeing Greg serve as Youth Director one summer when he was 19. Also Lisa, who sang her first solo at age six, continued to develop her music talent and ministry. Today she is a part of the music ministry team at her church – Community Bible Church, San Antonio. Jeffery was also an active part of their youth group in his high school years. He also sang with his sister at times. Today he and his family are active members of their church – Bulverde Baptist. In October of 2004, Bro Frank began as pastor of First Baptist of Menard. While there Bro. Frank also served their Music Director. Though small in numbers, they had faithful choir members and enjoyed preparing for their Christmas music and the plays that they did there. They also enjoyed good fellowship with the church leaders there. In October of 2006 Bro. Frank and Rosemary came here to Western Hills Baptist Church. They say they have enjoyed a very special bond with this church family and feel privileged to serve their Lord here with such a loving, supportive and faithful congregation. They also say that a special blessing here is the “Best Choir in Texas”. Bro. Frank trusts God’s Word implicitly in his life and as a pastor. His preaching “style” is basically expository, gleaning from various versions of the Holy Bible, but preaching primarily from the King James and New King James versions, Bro. Frank delivers The Word as it is written, with no apology, and allowing God to use him as His anointed messenger. He commits himself whole-heartedly to following Christ’s commandments to Peter in John 21:15-17 to “…feed my sheep…”, fulfilling both spiritual and physical needs of his flock. We at Western Hills are blessed to call Bro. Frank Pullin our Shepherd. I can’t wait to see you at WHBC! Christian beliefs are constantly challenged and shaped by many influences outside the church. If you have questions about theology, history, philosophy, ethics or science click Here to find answers from a great website.